When you come in for your consult you will actually meet with Dr.Gulani and he will take all the time needed to explain and educate you in your best interest. Dr.Gulani is a strict believer in educating patients and also against any media hype and false advertising. He will breakdown all testings and test results and also walk you through in the planning for your custom-tailored surgical technique. While asking these questions, look into your surgeon's eyes and look for unflinching confidence and caring. Good bedside manners and communicability are important. Get a feel for the ambience of the practice during your interaction with the staff. Ask to speak with some of the patients who have had surgery. 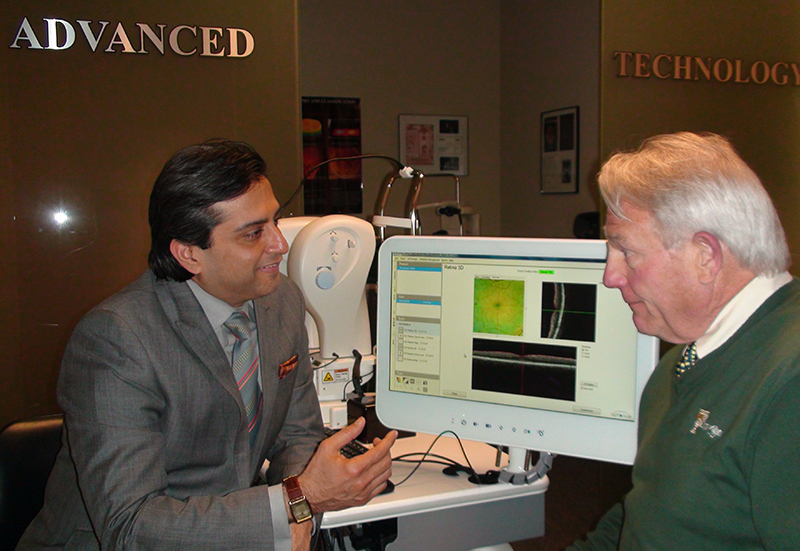 Dr. Gulani personally engaging Laser Vision patient in a one on one question answer session before surgery. Please explain all these flashy diagnostic tests that I have just undergone with you technician? Do not be dazzled by flashing screens and graphics. These are scientific tests and make sure your surgeon really knows what they are and is not using them to impress you visually. Dr. Gulani teaches diagnostic aspects of LASIK surgery to eye surgeons worldwide and personally takes the time to educate his patients so they understand his tailored surgical plan for them. Are you able to take care of complications that may result from Lasik surgery? Even though rare, complications can always happen and it is imperative that your Lasik surgeon be capable of having the skills to take care of them. Ask for Proof. Dr. Gulani is a world resource for LASIK complication management and utilizes his advanced corneal surgical skills, innovative instruments and protocols to successfully manage these situations. Will you be there for me before, during and after the Lasik surgery? Dr. Gulani himself is involved in your total eye care throughout the Lasik experience. Do you teach Lasik surgery? If so, to whom and where? Many Lasik surgeons host dinner or other events to lecture to groups of individuals or even doctors. Dr. Gulani is invited to teach at prominent national and international podiums to teach Lasik surgeons from all over the world. How do you keep current with your skills and technology? Dr. Gulani is always involved in cutting edge technology and research and keeps advancing his skills and teaching his techniques nationally and internationally. What has been your training in Lasik surgery? Many surgeons have learnt Lasik at some weekend or weeklong course and have been practicing Lasik surgery (Some may be doing so for years). Dr. Gulani has spent two dedicated years in studying Lasik and the whole spectrum of Laser Vision Surgery and is among a handful of eye surgeons in the entire country who are so expertly fellowship trained. Why do you advertise that you are the first or the best in Lasik? Some surgeons may advertise to be the first in a certain technology in a small geographic locale just because they were the first to buy the equipment or they negotiated with a company to first buy it on an exclusive basis. None of these situations signifies their expertise or selection based on leadership or skills. Dr. Gulani is often selected from among the first in the nation and world based on his skills, reputation and expertise. How do you know that this technology and surgery is the best for me? Surgeons may have read some points in some periodical or they may be repeating information from an industry representative? Dr. Gulani is always ahead of the curve by evaluating and testing new technology and being a consultant to the eye care industry and laser manufacturers, he has first hand knowledge of what is best suited for his patients. Do you do surgeries other than Lasik? It is extremely important that your surgeon be a master in the full spectrum of vision corrective surgeries so that they can be unbiased in selecting the best suited procedure for you rather than subject all patients to one technique due to their own limitations. Dr. Gulani tailors the choice of your surgery based on your best suitability from an extensive array of surgeries he performs and also based on his widespread involvement with advances and research.